MORI-SEIKI – We have now achieved the highest-level of speed in the world 4th-Axis Horizontal machining after recently adding a new NH 5000 to our facility. 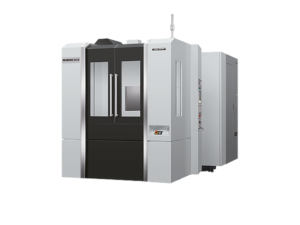 The NH 5000, is a high-precision horizontal machining center in the NH Series. Two new HAAS VF4 SS™ to our facilities listing. The HAAS VF-4SS™ comes standard with an innovative 12,000-rpm inline direct-drive spindle, an ultra-fast tool changer and 1400-ipm rapids. The unique inline, direct-drive system couples the motor directly to the spindle rather than using belts. Less vibration, less heat and less noise than other drive systems provides better surface finishes, thermal stability and very quiet operation. “Fadal machines are versatile and fast”. This was a critical reason Abbecan Industries Inc. decided to install one. We are able to cut 3D directly from the control and switch to 2D without any major set-up changes with the finishing speed and accuracy we need. The VMC 4020 has a 15 hp motor providing spindle speeds from 75 to 10,000 RPM. The performance of the 4020 can be attributed to its large casting with a wide and thick box way, which decreases vibration allowing the 10,000 RPM spindle to be pushed even harder than usual. In addition the X,Y and Z axes can slide faster and smoother while holding increased positioning accuracy and repeatability. “The MIYANO JNC-60 has all the very latest technology for increased productivity. This heavy-duty slant bed machine is designed to provide faster part cycle times, faster turret indexing time and higher spindle speeds permitting more efficient machining. Cycle time needed to finish a work piece has been shortened so finally a CNC machine can compete with a screw machine. One of the first CNC machines we acquired, the EX-CELL-O 605 is known for its ease of programming. Excellent for short runs and prototype work, this machine is extremely flexible for machining of light metals. Virtual Gibbs is the simplest and yet most powerful PC-based CAM system available today. The interactive graphic interface places all programming functions, geometry, cutting tools, tool paths, cut part rendering and post processing at our fingertips. Virtual Gibbs’ flexible programming methods and full associativity enables us to achieve new levels of productivity. 3D real-time cut part rendering shows the material remaining as the tool takes each cut. High-quality graphics display a realistic 3D model of the cut part while we program. Tool interference is flagged in red providing visual verification and quick identification of errors. Full associativity allows us to correct errors and make program changes quickly and simply. All the unique elements of Virtual Gibbs work together to create a programming environment that results in optimized programs and quick turn around times. The ELUMATEC MGS 142/11 and the CPO 275 Scotchman (BEWO) high speed cutting saws are ideal for non-ferrous cutting of tubes, profiles and solids. These machines will cut to +/- .005″ tolerances while producing virtually burr free cuts, and in most applications eliminate the additional expense of deburring altogether. Computers and machinery can create a lot of heat that can stop them from working efficiently. This problem can be overcome with a Heatsink to enhance heat dissipation from hot circuit board surfaces. Abbecan Industries is able to make Heatsinks in solid or extruded Aluminum as well as multiple types and alloys of sheet metal. With fins or ridges that can increase surface area to effectively dissipate heat into the surrounding air, ultimately protecting your machinery and IT systems.